Roger Federer quickly turned around from a horrid opening service game to cruise past Tomas Berdych in his opening round robin match at the 2015 Barclays ATP World Tour Finals. The Swiss maestro missed all of his first serves, delivered two double faults, and was broken at love. He quickly broke back, and then took command of the match from 4-all. The 6-time World Tour Finals champion broke the Czech and comfortably served out the first set. Upon back to back breaks in the second set, the 34-year-old Swiss eased to a 6-4 6-2 win in 69 minutes. Behind 63% of first serves in play, Federer won 86% of points on his first serve, hitting 20 winners. Eight of them, drop shots. The Swiss won nine of twelve points at net and converted four of six break point opportunities. Sunday’s solid win sets up a Tuesday that will draw all tennis fans to their television sets, screens, and the O2 Arena – a showdown with Novak Djokovic, worthy of a grand slam final. The Serb had no trouble defeating Kei Nishikori, who is carrying over the remains of a recent injury from the Paris Masters. 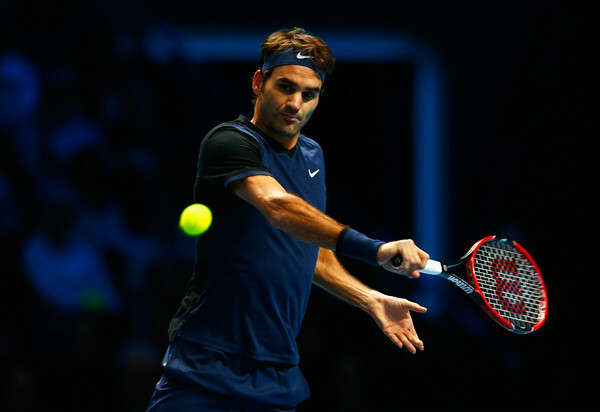 Watch full coverage of the 2015 Barclays ATP World Tour Finals on FedFanTV. All Roger Federer. All the time.